I assume it's on a 1275 (can't think why anyone would want a 44 on a 998...) ? Yes, it's out of a cooper. When I first fitted it i kept the origional gearbox and the final drive ratio combined with the 13" rims and high profile tyres meant the acceleration was,at best OK, but when I tried towing the puck I was down to 3rd gear and 40 mph up even a slight incline. I've since fitted the earlier 'box together with the 4.1 diff and it's now at lot better. One day when you have a minute, a pic of the carb installation would help. Despite this SPi only having done 7,000 the 3rd to 2nd change crunches so the gearbox has to be looked at prior to transplant. I'll check the final drive ratio at the same time. With you 4.1 have you got 12" or 10" wheels? 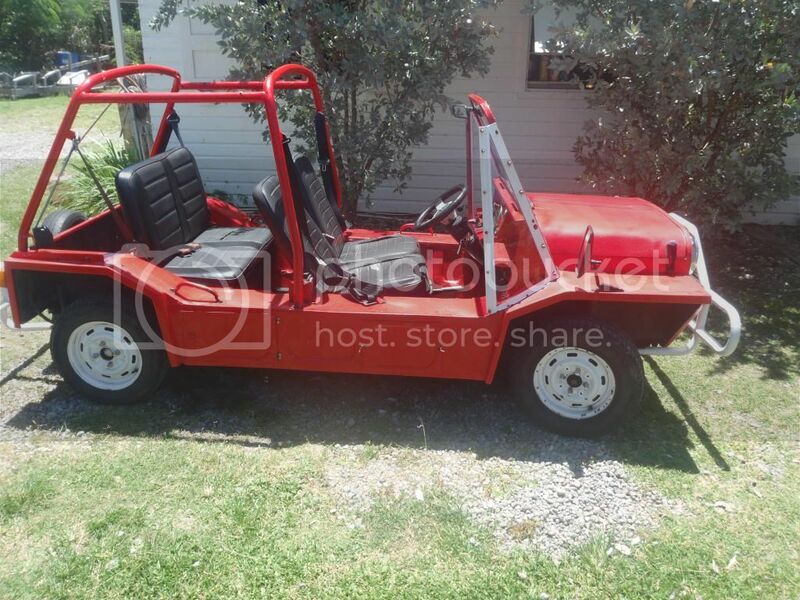 Chris, I can organise it for you to get a brand new 1000 cc 'Mini Moke', in Green, Blue, Red. Orange, Yellow or White. PM : Me and I'll arrange it for you. It would go a long way to replace your red one. the late model SPI and MPI prone to gear box crunching.. in 2nd and 3 rd usually just a synchro . easy enough to fix.. I have an HS6 on an ex-Rover SPi Mini motor and it runs like a dream. I couldn't get an HIF44 too easily here in Downunderland so opted for the HS6 instead. It fits a treat, although obviously not with the standard air cleaner so I run with a Ramflow unit. I run 13 inch wheels with 175/60 tyres and the standard 3.6 ratio Mini diff - no trouble at all and only 3,200rpm at 100km/h (whats that - about 65mph). Heaps of torque so no issues with keeping the top speed on the motorway. If you want NEW carb.. HS 4. HS6 HIF 44. best to just order from Burlen fuel systems in the UK DIRECT.. only about 150 quid for NEW carb.. these are NOT just rebuilt ones..